Your chance to win an Ultimate Vitamix Upgrade package - Got Greens? This new year season, we are giving away our first Ultimate Upgrade Package to someone in our Vitamix community! 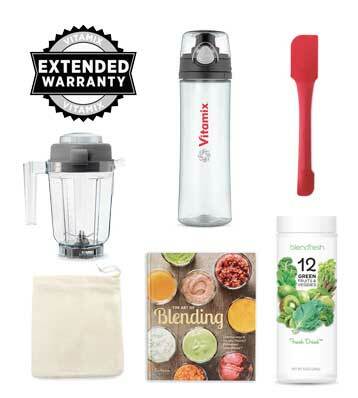 Worth nearly $400, our giveaway package adds everything you need to get the most out of your Vitamix! Using promotion code 06-005220 when purchasing your Vitamix blender direct from Vitamix automatically makes you eligible to win (code can be given for online and phone orders). Open to residents of US and Canada a minimum of 18 years old. All winning entries will be validated and confirmed prior to awarding the upgrade package. Accessories and warranty are only valid for Residential blender models. Container of your choice must be compatible with your current Vitamix (includes your choice of 32-oz dry grains, 32-oz, or 48-oz for any C-Series or G-Series models. C-Series models may also choose the 64 oz container. Winners with a Vitamix S-30 will be automatically be awarded the 20-ounce container that is compatible with the S-Series blenders. Exact contents of the upgrade package is subject to change without notice. A warranty extension may only be applied once during the lifetime of your machine. This offer is sponsored solely by Got Greens? and WholeBlends (a premier Blendfresh partner). Have questions? Please contact us – we are here to help!